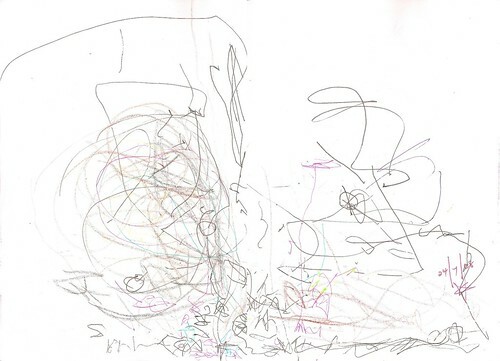 Big Buddy loves to exercise his self expression through free-form drawing. We often find him doodling with whatever media he lays his hands - all types of pens, pencils, markers or crayons on his drawing journals or just about any scrap of paper he finds. We have encouraged him to draw and paint since less than 2 years old by providing various materials for his experimentating. I am blessed with a mother who previously taught art and had produced students with award-winning works. She had been instrumental in fanning Big Buddy's art interest and guiding him. Over the years, Big Buddy had filled several art journals with his creations and I enjoy flipping through them to witness how his drawings have matured. Lest anyone says I have been biased towards Big Buddy, here are some of Little Buddy's too. He has great concentration power when it comes to drawing. Similarly, he has been given his own art journals to record his emotions and thoughts. After he outgrew the stage of throwing crayons around, he has shown more interest in producing some quirky work. While Big Buddy draws with broad bold strokes, Little Buddy has been great with fine detail work. 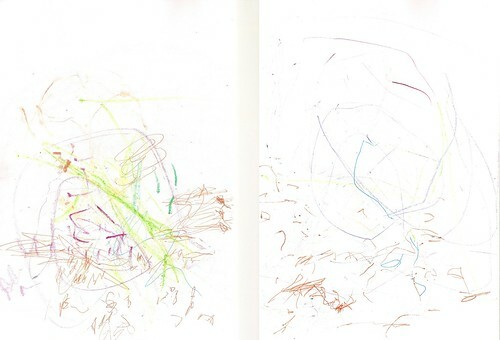 Here are his recent renditions of the Chaos Theory. My daughter enjoys looking at the drawings. "Very cute!" she commented. Little Buddy is off diapers.....Hooray!